Jack Butala: What I Look for in a New Hire Employee. Every single month we give away a property for free. It’s super simple to qualify. Two simple steps. Leave us your feedback for this podcast on iTunes and number two, get the free ebook at landacademy.com, you don’t even have to read it. Thanks for listening. 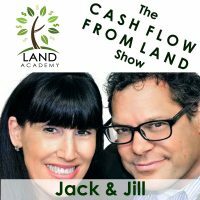 Jack Butala: Jack Butala here for Land Academy, welcome to our Cash Flow From Land show. In this episode Jill and I talk about what we look for in a new hire employee. Hey Jill. Jack Butala: I bet we differ on this, like most of these shows. Jill DeWit: I’m sure we do. Jack Butala: I think this is so important because, and I’ll just be upfront about it, new hire employees have completely different skills and traits than really good Land Academy members, I think, but let’s start with your top few traits. Jill DeWit: Okay. What’s funny is I think that you’re going to be surprised by mine. I’ll just tell you. I look for three things, and yes I took notes again before the show by the way. Jack Butala: Oh my gosh. It’s like we have a real show. Jill DeWit: I was here in my sit early. Early in my sit, headphones on, ready to go, smile on my face. Jack Butala: Sometimes working with Jill is like herding cats. Jill DeWit: That is perfect. I would have to agree with you on that. Jack Butala: But that’s why you’re so successful at the stuff that you’re responsible for. Jill DeWit: Herding cats, oh my goodness. You’ve never said that to me and that’s great. Jack Butala: Again, it’s a compliment. Jack Butala: I’ll tell you, there’s been some rough … Let me tell the truth, we’ve had some moments. Jill DeWit: You laugh about it now, like we were laughing about it a while back. Jack Butala: We have had some moments in the office together and it’s all because of this I decided, Jill and I have always wanted the same thing, always. Long term, short term, I think really in the real root of it. But like everybody we go about it a little bit differently. You’ve got to stick with and iron out those differences, and what ended up happening with you and I … This is so off topic in the first thirty seconds. What ended up happening with you and I is I think we just took a look at the responsibilities that have to go on and we gave the stuff to you that you shine at naturally, and all the other stuff fell me and I delegate it when I need to and do the stuff that I need to. That, at that moment it really seemed to work well. Jill DeWit: For me it was not only dividing up the responsibilities but leaving each other alone about them. Jill DeWit: I know the things that you’re good that, I have no business weighing in on it, none. Jack Butala: Yeah just trust. Jill DeWit: Letting it go. Jack Butala: I mean you’re great with. Jack Butala: You’re great with customers, any place where’s there’s customer, any kind of human contact you’re awesome at that. Jack Butala: I’m better at … Never mind. Jill DeWit: Here’s an example. Here’s one little thing too. My office is open, there are people around, there’s communication, there’s laughing, there’s things like that. Your office, very different. Jack Butala: There’s a lot of equipment. Jill DeWit: I do. Yes. Jack Butala: It’s all happy and bright. I have a sound stage. Jill DeWit: You do, you’re in the studio. Jack Butala: It’s all [deck 00:03:34] I could be on the lake too. Jack Butala: In a beautiful executive office and all that. I don’t want that. Jill DeWit: It would mess with your lighting. Jack Butala: I work in a hole. Jack Butala: I’m really happy with this, I’ve been in a lot of offices, a lot of different careers and a lot of different positions, I love this office. It’s probably the cheapest one I’ve ever had. Jill DeWit: You’re quiet, you’re in a quiet … Your office in particular, not your people, you’re around the corner kind of hidden. I know you like it like that, with not a lot of traffic. I know it’s perfect for you. Back to what we were talking about. Jack Butala: Yeah, let’s talk about the actual episode topic. Jill DeWit: This comes up because I just had one of our members, I did a consulting with him on Friday and this was one of the topics that we talked about because he was asking, “When should I hire some help? How should I do about it?” There’s a couple of ways to do it depending on your budget. You can do freelance stuff, which I highly recommend because it’s cheaper and you can do it by the project and as needed. Jack Butala: Yeah, virtual assistant. Jack Butala: A topical virtual assistant is what they call it. Jill DeWit: Exactly. But then there’s a time where you reach a point where you just need help in office, right there because there’s so much going on. Jack Butala: There’s two camps on that, there’s full time help and then you expect that person to be reasonably at all these little silly things that we have to get down. That’s very different things by the way in our world. Jack Butala: It might be our generation Jill because I agree with you. Jack Butala: But there’s a lot of people that I think are a little bit younger than us that love to have these task specific things done overnight, on the internet, by someone a lot of times in a different country. There’s a real high turnover with that, and there’s still some stuff that I do, some of this audio, video stuff that I send out but in general I will take working with somebody on a long term basis and teaching them and I guess you call it seasoning them. Maybe we’re closer on this than I thought. Jill DeWit: Mm-hmm (affirmative). What we talked about the other day with one of our member was about, I really cautioned him to make sure that he’s keeping the important things that he does best still on his plate and subbing out the little stuff, the little paperwork, the deeds, that stuff that’s easy to sub out and it’s not going to wreck your business. Don’t sub out answering the phones because that could wreck your business. Jill DeWit: It’s time consuming. Jack Butala: It’s very time consuming. You have to do it right or it’s going to get kicked back. We’re going to launch fairly quickly here, one of the people in our office is very interested in helping people do that for a certain amount per … Because we all do the exact same thing, wouldn’t it be great if you could just go to Land Academy and say for a certain amount, let’s say fifty or a hundred dollars a transaction, just like escrow, you get all this stuff done and you hand me the deal back and it’s done and recorded. Jill DeWit: Yeah, that’s going to pop up on our resources page at some point. That’s going to be available. Jill DeWit: That’s what we’re going to do. Jack Butala: That’s a great place to put it Jill, [crosstalk 00:07:57] think about that. Jill DeWit: Yeah, that’s what I told her. It’s going to be on our resources page. I said, “We’ll advertise it for you.” She’s going to be so inundated with customers quickly. Jill DeWit: No, I’m going to make her hire help. Jill DeWit: For her own little company. Jack Butala: You’ve obviously thought this through. Jill DeWit: I’ve thought this all through. Jack Butala: I’m zipping it. I love when that happens. Jill DeWit: Thank you. That’s what I said, you can hire your own help then, for your own business. Jack Butala: This is a partnership, you’ve got this all under control. You thought it all out already. Jack Butala: I’m asking a question, you’re just reeling it off and pretty much saying, with your eyes you’re saying, “Steve stay out of it, I know what I’m doing.” I love that. I can’t describe how much I love it. Jill DeWit: Thank you. I appreciate that. What do I personally look for in a new hire employee? I’ve got three things that I wrote down before this. One is flexibility, two is efficiency, three is detail. Flexibility, we are constantly changing gears around here and it’s a lot of it because where there’s customer involved there’s shows and marketing involved, there’s media, social media changes. Even the paperwork there’s so many details that go on, there’s so many parts of our business that you’ve got to be flexible and you can’t get hung up on something. By the way, the way that this county … Even a little thing, like the way the county does this might change, they now need this form, or the form’s changed. You can’t get hung up on little things. Fees change, all kinds of things, you’ve got to be flexible. Two, efficiency. I need a machine. I need someone that get things in the machine, because I’m not that great at it. I trust my people to … I have told my employees to, “Here’s what I need done, this is what I got started, I know you’re better at this than I am. Will you just figure it out and teach me and tell me what I need to know?” Because it’s just easier. Why is that funny? Jack Butala: No, it’s great. We are different on this and that’s good. Jill DeWit: Okay, that’s my thing. The number three is detail, I’m a stickler for that. Jack Butala: Nobody can debate that. Jill DeWit: I’m a stickler for, we’re going to be perfect, I get it, but let’s try our best to do it right the first time and save ourselves a lot of time and energy cleaning up things, than just whipping through it. That drives me crazy. Jack Butala: I’m driven to drive … The decision for me to hire anybody, or hire additional people, comes very specifically from when I no longer want to do some stuff. My thought process, the short version of it is, you come up with an idea, you try some stuff, you talk to some people, you check it out. You do it yourself for a while, you kind of perfect it and then it’s like, “I’m over it, I conquered this. This is great. Now I need to bring somebody in. I have the system on place and I just need an implementer, a tasker. Jill DeWit: Because you’ve got it up and rolling and you got it where it needed to be, and then you’re happy to hand it off. Jack Butala: Yeah, it’s been that way … When I started Land Business, years and years and years ago that was it. I was filling eight hours with stuff that I should not have been doing any longer. Jill DeWit: Did you get bored? Is that why? Jack Butala: Yeah. It’s not boredom, it’s like … Yeah, maybe it’s boredom. Jill DeWit: I was asking [crosstalk 00:11:25] do you like a new challenge? It’s like, I figured it out, I conquered it, now I want to conquer something else? Jack Butala: You end up asking yourself this question, you and I have had this conversation more than three times in the last week even, “I should be doing this. If I was doing this thing over here, doing this little offshoot startup thing of this,” it comes down to money. Are you losing money or saving money by doing this eight hour stuff of tasks? I’m always losing money by doing stuff myself. Jill DeWit: But part of that is, you and I know it’s hard to find people sometimes. Jack Butala: That’s the part of it I want to talk about. Jill DeWit: Yeah. I’m struggling with that. Jack Butala: It’s tough man. Jill DeWit: I have an example. I’m trying to find someone to be a consultant who really knows social media forwards, backwards, upside down. Jill DeWit: Her husband’s an attorney, they’re both trying to think of somebody. I’m like, “You guys really don’t know somebody in your world? You know movie producers in your world and you can come up with this?” Yeah. Jack Butala: Finding people’s tough. That brings me to this little side offshoot we’re going to put in resources page here very soon about there’s a very finite number of tasks that go on that our members accomplish or they have to do it to succeed and they’re all the same. Now we’re providing expert, I mean expert, expert talent in those really niche-y, specific areas for not a lot of money. It’s going to get done right because we’ve done it for fifteen thousand deeds. Jack Butala: It’s unusual. Across the gamut of stuff that goes on here everyday between Land Stay and Land Academy, there’s video production, audio production, there’s deeds, there’s title searches. That’s a pretty wide array of talent. Jack Butala: I agree with you. If we approached trying to find somebody that had all those talents, we’d never hire anybody. You have to teach somebody. Jill DeWit: That’s very true. It’s hard sometimes, we have to be experts at a lot of things, that’s the nature I think of being an entrepreneur. Jill DeWit: You have to be prepared for being out of your comfort zone often and learning things, because ethere’s no one else that can do it, period. Jack Butala: Yeah. It’s not going to work, you have to be a talented chef in the first place to design a great menu, that’s where the talent is.